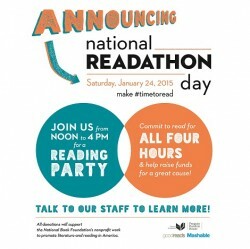 National Readathon Day (NRD), January 24, is only two weeks away. Just in its first year, the event came out of the Random House/Penguin merger in 2013 and asks participants to read four hours that day, from noon to 4:00 PM in their respective time zones. A giving site has been set up, and online resources are still available to help you promote this in your libraries and schools. For more background on NRD and its supporters, check out Lisa Peet’s recent piece on LibraryJournal.com.